Fashion that incorporates animal images or shapes usually evokes one of two things - cute and cuddly or hot and fierce. A new line of accessories falls into neither category and it's really quite disturbing. Don't buy these fashion accessories for anyone's stocking this Christmas, unless you're prepared for a nasty complaint letter to be delivered to Santa and his elves. Designer Reid Peppard has created a line of taxidermy accessories for those dead animal lovers who just don't get enough of hanging animal hide and heads around their homes. 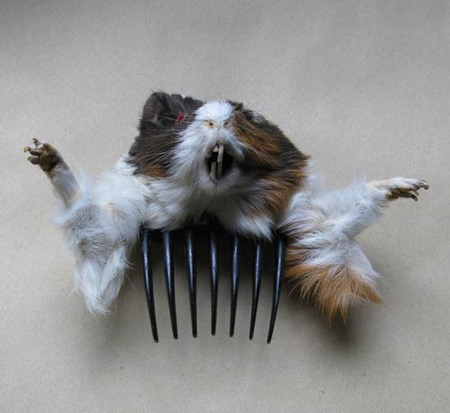 Now it's possible to really show off a love for the morbid with cufflinks made from mouse heads, coin purses made from rats, and even hair accessories from dead guinea pigs. Spare those you love this holiday season, and stay far away from this terrifying line of fashion accessories! Design Boom's 2008 Green Earth Design Winner: "Greening"
If you had taken the time to look through Reid Peppard's work, you would know that she only picks up roadkill. The message of her work is to turn the bodies of animals that would have normally just been seen as filthy trash into something to be admired. Do a little research before posting.